Comedian Mike Birbiglia demonstrates enviable affability in My Girlfriend’s Boyfriend at the AT&T Performing Arts Center. As a comic storyteller of extreme affability, Mike Birbiglia practices the art of honesty. He’s cringe-worthingly honest. Painfully honest. Hilariously honest. Birbigs, as he’s called, brought his ode to life’s learning curves, My Girlfriend’s Boyfriend, to the Winspear Opera House in the AT&T Performing Arts Center on Saturday night. People laughed even as they nervously shuffled in their seats and nudged each other. Our high school, dating and growing up was also rife with similar awkward and devastating moments we’d tried to forget. Yet here we were remembering and, this time, laughing about it. The audience warmed to Birbiglia’s self-depreciation immediately. He lacked the nervous intensity of many stand-ups. Instead he’s the non-threatening guy like your funny cousin or schoolmate who’s a blast at parties. He has truly found his voice. It’s highlighted in the moment around which his movie Sleepwalk with Me revolves. Marc Maron prods him to stop trying to be someone else on stage and sucking at it, and instead to just be himself and speak of his life. From that realization Birbigs formed a conversational style where he talks with, not to, the audience. It’s a slow build in which gentle laughs accumulate into a big satisfying heap of humor. Birbiglia’s subdued every-guy demeanor is lifted by his funny physicality, reminiscent of the way he acted out his dreams in Sleepwalk with Me. He recreated a ride in the Scrambler at the amusement park that generated a spew of “carnival salsa,” and spun about in a car wreck during which thoughts of mortality taunted him. 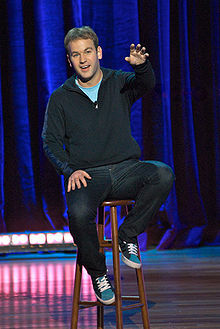 And nobody recreates the tamped-down spastic dancing of young, straight, white males like Birbigs. Birbiglia knew he wanted to be a comic ever since a homework partner thrilled him by imploring him to stop making jokes because she was afraid she’d pee herself. But there were writer yearnings, too, since third grade, and the screenwriting and playwriting he studied in college. Fuse all that with an overwhelming desire to be a member of the high school make-out club, only to want out of the club as a maturing adult, and you have Birbiglia’s My Girlfriend‘s Boyfriend. He made me laugh so much I had to go pee. Score for Birbigs! 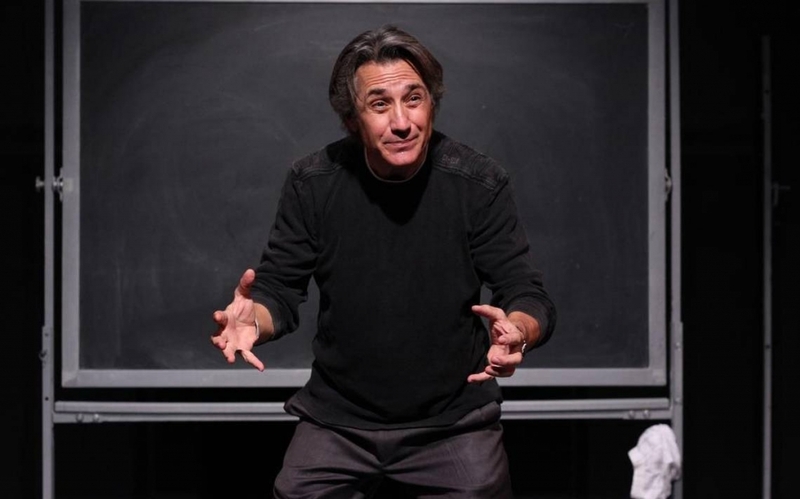 Fusing the craft and production values of a one-man theatrical play, with the emotional intimacy capable in a stand-up show, the show was dense with jokes, though always integral to the story. He is a master of comedic recollection, taking those crucial seconds of an incident and stretching them out into a suspended instant that he views through his warped vulnerable lens. But in that moment toward the show’s end, with Birbiglia sitting on the edge of the stage, having gone past comedic confession into human truth, the audience was so transfixed that you could hear a pin drop. You knew then you were firmly in the realm of theater. My Girlfriend‘s Boyfriend picks up where Sleepwalk With Me ended, with Birbigs single and determined to stay that way, emphatic that marriage was a sham. Much of it is an exploration of the way high school relationships haunt our adult days. Having to re-enter the dating game as an adult prompted memories of finally getting a high-school girlfriend and his much anticipated entrance into the make-out club, but eventually realizing (after he took the blinders off) that his “girlfriend” did indeed have a boyfriend and it wasn’t him. The show traces his slow patient taming by girlfriend, and now wife, Jenny, who also had a boyfriend that never fully went away. But while there’s endless material in relationships, it very occasionally slid into sameness and you yearned for the quirky variety of focuses presented in Sleepwalk with Me. A journey of self-discovery, My Girlfriend‘s Boyfriend is authentic, not a bit trite, and without a hint of specialness. Pivotal to the story is his Very Bad Day featuring of a throw-down argument with Jenny, cross-country travel, missed tram, missed flight and a missed gig. It culminates in a car wreck where California police wrongly assigned him fault. It’s a stunning exploration of a misplaced obsession with being right, what it’s worth and what it costs. A bit more weaving of the accident throughout the narrative would help it not be so jarring when it pops up at the end. 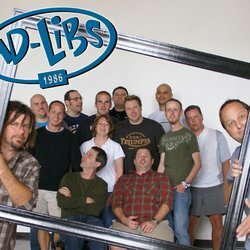 The show begins with a stand-up like mélange of topics including the shapeless body of the middle aged (“I’ve given up on the male physique and am now happy to be a strong independent woman”) and the eternal frustration of tech help lines (“Customer service has become like seeing a therapist. They don’t actually offer solutions, just sympathy.”) But in the midst of it all is a jewel about gymnasts and how even after they botch their routine and take a spectacular tumble, they always stand up, raise their arms to the sky and smile. That in a nutshell is My Girlfriend‘s Boyfriend and the life of Birbiglia as well.